Kevin Oliver Carter was born on June 21, 1962 in Summit, New Jersey to Oliver Brown and Loretta Hill (Carter). He received his elementary education in the Newark Public Schools system. 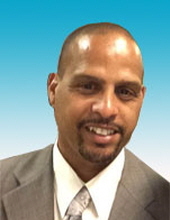 After moving to East Orange, Kevin attended and graduated from Clifford J. Scott High School in 1980. While still in high school, Kevin enlisted in the United States Marine Corps on October 19, 2879. He proudly served his country, with the Marine Fighter Attack Squadron, as a parachute rigger from 9/4/80 until 9/3/84. During his time in the USMC, Kevin traveled the world, as he was stationed in Japan, Korea, Guam, and the Philippines. Upon completion of his four years of active duty, he reenlisted as a reservist for an additional two years. On 9/4/86, Kevin was honorably discharged at the rank of Corporal. In 1985, Kevin began to court a childhood friend named April Terry. This courtship led the couple to join together in holy matrimony on April 23, 1987 while Kevin was home on leave from the USMC. Through their union, Kevin and April had one child, a daughter named Bianca Charde. When Kevin returned to New Jersey, he lived in Newark and East Orange before, finally, settling down in Union, where he would reside for the next 30 years. Kevin was employed by Elan Chemicals before moving on to Prudential, The United States Post Office, New England Motor Freight, and then, Conrail. Following the tragic events of 9/11/01, Kevin would make his final career change. He was hired by the Port Authority of NY/NJ (PATH Division/Brotherhood of Locomotive Engineer Trainmen Local #497) as a conductor. Kevin was later promoted to the title of engineer. He would work for PATH for the next eighteen years. Kevin was an avid sports fan. He enjoyed playing basketball, loved the New York Mets, but his favorite athletic past time, was those “Fighting Irish” of Notre Dame. Kevin loved anything about Notre Dame. To him, South Bend Indiana was the Holy Grail. If you asked him, he would tell you that he was Irish, so much so, he tattooed that Irishman on his arm. Everyone also knows how much he loved his Budweiser. However, the most prized possession to Kevin was his family. He was a true patriarch and leader of the “Carter Clan”. Kevin took the lead when it came time to organizing and hosting family barbeques. During these events, he made it a point to spend time with each guest, whether you were invited or not. Between telling grossly exaggerated stories (i.e. lies) about how great he was, how many people he killed or beat up, how good looking he was, how much money he had, dancing like a fool, or his days of glory in the Marine Corps., Kevin drilled historical facts about our Carter family into the heads of his many family members, especially his younger cousins, nieces, nephews, and Godchildren. He made sure they knew the power that the name Carter possesses. Kevin ensured the younger generations knew about their elders, whose hard work, struggles, and sacrifices culminated into this great family name, Carter, that we were blessed with. Kevin impressed upon them the importance of honoring the Carter name and their responsibility to carry the name and traditions on for generations to come. Kevin was indeed an ambassador for our family. Any and everyone who encountered him would repeatedly be told how great our family was, and how our family crest stretches from Alaska to Japan and from Detroit to Atlanta. Whether you called him son, husband, father, uncle, cousin, cuz, cuzzo, sheed, Godfather, any of a few choice words that would be considered inappropriate to print here, or his favorite, “Jigga”; one thing is for certain: To know him was to love him. In the morning hours of Tuesday, January 8, 2019, God reached down with his almighty hands and called his angel home. Because he gave his life to Christ, we can rest assured, Kevin now resides in Heaven along with Grandma Ana, who he adored so much. Our dearest Kevin is survived by his loving wife April and their daughter Bianca, his parents(Apostle Cornelious, Pastor Loretta Hill, and Oliver Brown), his brothers(Keith and James Carter), sisters Kimberly Carter, Sharon Moore, Stephanie Hill, and Zomona and Jessica Brown), and Godchildren(Dorell Taylor, Tyrone Hairston, Daniel Francis, and Brittany, Kylee, and Avery Carter). Kevin also left many profound and loving memories with his various aunts, uncles, cousins, nieces, nephews, friends, neighbors and co-workers. A special shout out to Little Jigga, Jada Francis. To send flowers or a remembrance gift to the family of Kevin Oliver Carter, please visit our Tribute Store. "Email Address" would like to share the life celebration of Kevin Oliver Carter. Click on the "link" to go to share a favorite memory or leave a condolence message for the family.